People watch as a moose is weighed at the Gateway Variety store in Ashland on the first day of the 2017 moose season in Maine. The store is one of the most popular tagging stations in the area. Kylee Lothrop measures the antlers on a moose while helping Amanda Demusz (left) the assistant regional Wildlife Biologyst at the Gateway Variety store in Ashland on the first day of the 2017 moose season in Maine. They were gathering data on the animals the hunters brought to the store to be weighed. 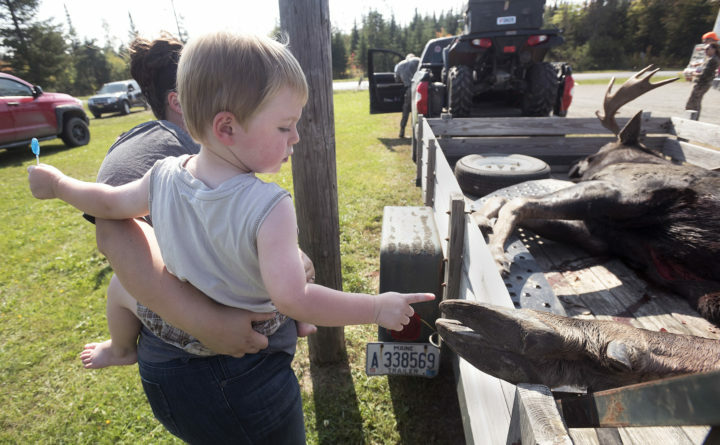 Two-year-old Wyatt Sullivan touches a moose that was brought in to be weighed and tagged at the Gateway Variety store in Ashland on the first day of the 2017 moose season in Maine. Wyatt’s mother, Kirstie Hankes said, that she brought him to the tagging station so he can see the hunters arriving with their moose. 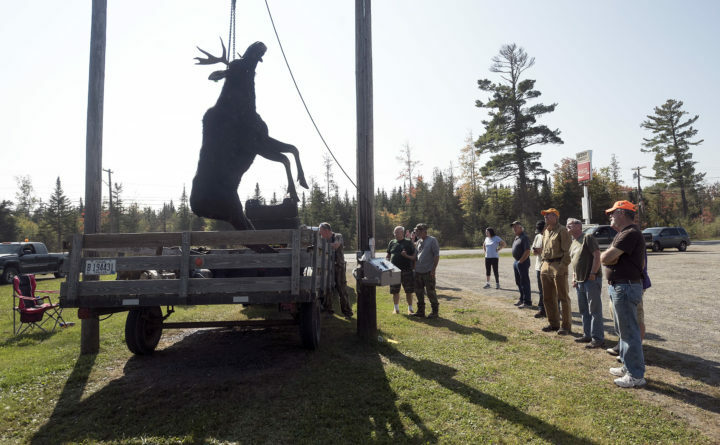 People watch as a moose is weighed at the Gateway Variety store in Ashleand on the first day of the 2017 moose season in Maine. The store is one of the most popular tagging stations in the area. A moose is weighed at the Gateway Variety store in Ashland on the first day of the 2017 moose season in Maine. The store is one of the most popular tagging stations in the area. A moose is guided back into the bed of a pickup truck after it was weighed at the Gateway Variety store in Ashland on the first day of the 2017 moose season in Maine. The store is one of the most popular tagging stations in the area. ASHLAND, Maine — On a slow morning of moose-tagging, Amanda DeMusz spent a portion of Monday morning doing exactly what the moose were doing: She hunkered down in the shade. “Fair skin and red hair don’t mix with this sun,” the Maine Department of Inland Fisheries and Wildlife biologist said as she sought relief in the shady spot underneath her pickup truck’s tailgate. Neither, it seems, did dark hair and huge antlers. Traffic at Gateway Variety, typically the state’s busiest tagging station, was significantly slower than usual on the opening day of the first week of moose season. DeMusz said she didn’t expect that to change on Monday … or anytime soon, for that matter. By noon, the temperature had reached 80 in Ashland. Predicted daily high temperatures are expected to come close to that level through Wednesday. And the evening lows aren’t predicted to drop below the 50s over that span. As of 1 p.m., just 11 moose had been tagged in Ashland. A year ago, by 1 p.m., nearly 20 had been tagged. Monday was the opening day for the first of four moose seasons to be staged in Maine this year. The six-day session wraps up on Saturday, and 720 hunters and their parties were allowed to head afield. — Sept. 25-30, with 720 bull permits in eight Wildlife Management Districts in northern and eastern Maine. — Oct. 9-14, with 1,095 bull permits in 19 WMDs. — Oct. 23-28, with 220 cow permits in five WMDs. 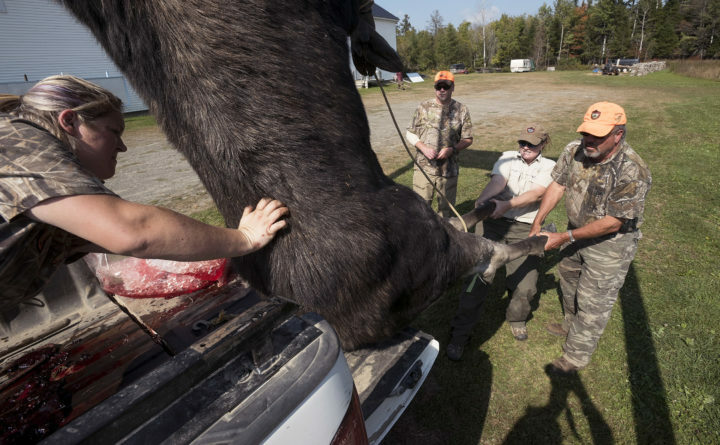 — Oct. 30-Nov. 25, with 45 any-moose permits in five WMDs in central Maine. Despite the heat, several hunters did have early success on Monday — emphasis on “early.” Most said they were in place and ready to hunt at legal shooting time, a half-hour before sunrise. On Monday, that meant hunters could shoot beginning at 5:56 a.m. Among those happy hunters was Emile Pelchat of Biddeford, who engaged in some good-natured banter with the moose-tagging crew. 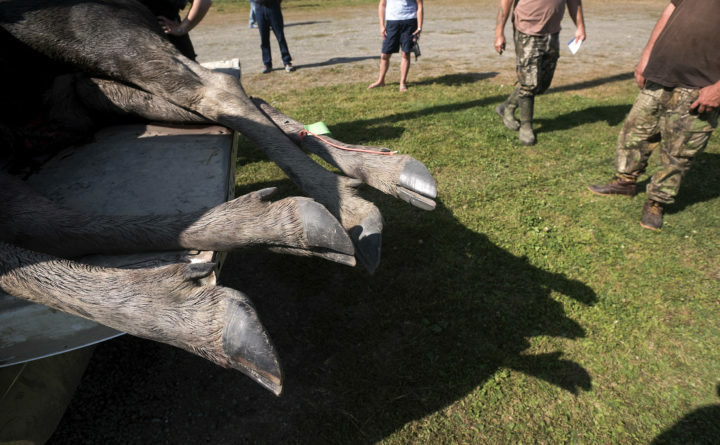 “Mind if I take a tooth?” asked Heather Stokes, who has helped out at the tagging station for years, and who was asking for permission to collect a sample that will let biologists determine how old his moose was. Pelchat laughed along, and had a good reason to: This marked the first time he’d been drawn for a moose permit, and he’d been applying for one since the state’s first modern moose hunt in 1980. “Thirty-seven years,” Pelchat said, shaking his head. And after so many years of unsuccessfully entering, he said, he had a hard time believing that he’d been drawn this year. 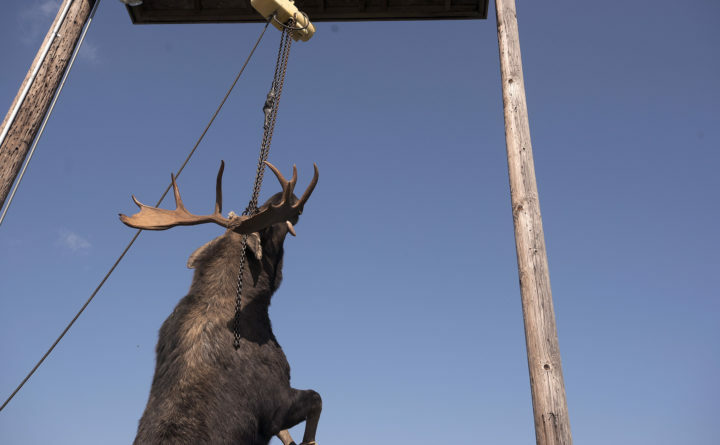 It didn’t take long for Pelchat to cash in: His moose was on the ground at 7:05 a.m.
“[My friend Ralph Laveriere] did some calling, and it walked right out and made me shake like a leaf,” Pelchat said. Pelchat’s moose was a 654-pound bull that sported an 11-point rack with a 35-inch spread. Hampden 17-year-old Parker Harriman also filled his tag on Monday while hunting with his mom, Veronica Lachapelle, and stepfather, Brian Lachapelle. Brian Lachapelle had spent some time scouting in the days before the hunt, and thought he had found a pretty good place to hunt on opening day. “As soon as we got in there we started calling, and we got a response from one bull. He answered a couple of times and then he ran off, we think,” Harriman said. After moving a bit farther down the tote road, the group set up again and started calling again. “Then we heard one coming,” he said. While moose hunters may want to get a close-range shot, this moose pushed Harriman’s comfort envelope a bit: It stepped out just 20 yards away from him. Harriman’s secret to remaining cool? “A lot of deep breaths, just trying to relax,” he said. That plan worked out just fine, as he bagged a 731-pounder with a 36-inch antler spread. At a moose-tagging station, the hunters aren’t the only ones who show up at the tagging station. A steady stream of observers stopped by to look at moose and listen to stories. Among those was 2-year-old Wyatt Sullivan of Ashland, who showed up with his mom, Kirstie Hanks. “Who shotted that one?” Wyatt asked at one point, pointing at a moose that had been hoisted up for weighing. “Another one!” he exclaimed as a truck pulled into the yard with a moose in the back. Wyatt has seen moose in his backyard, but Monday marked his first moose hunt, his mom said. And in another year? “He’ll probably be ready to do their jobs for them,” she said with a chuckle, pointing at the tagging crew.